With patient-centricity claiming more and more of the spotlight in both research and care (rightfully so), patient-reported outcomes will only play a large roles in clinical trials. But there are significant obstacles to getting quality data from PRO measures. Patients, especially those who are very sick, don’t want to hand-write dry medical diary entries. They don’t want to learn yet another electronic device, download and manage an app, or have to recall yet one more password. And who can blame them? Trial participants are the heroes of the research story, and when it comes to the collaborative process of data gathering, they deserve a hero’s welcome. OpenClinica teamed with Danish CRO, Signifikans, to implement OpenClinica Participate for a leading Denmark-based bioscience technology company developing an innovative treatment to alleviate colorectal disorders, a common side effect of numerous medicines affecting millions of people at any time. The study’s objective was to investigate exercise induced intestinal permeability, immune markers, and bowel habits in 18-40 year old healthy volunteers. Participants were given two strains of bifidobacterium, an anaerobic bacteria that resides in the intestinal tract. The study involved 48 participants throughout Sweden, and each patient was required to provide 65 daily diaries in addition to 5 in-person visits over the course of the study. In a similar prior study, the sponsor collected paper diaries from 700 participants. Each participant provided their (hopefully) completed and accurate paper diary to their site coordinator during the in-person study visits. The site coordinators then delivered the completed paper diaries to a data coordinating center. Coordinating center staff then scanned the diaries into a document management system and an overseas data entry vendor used a double data entry workflow to populate a database. Completed diaries were scanned and uploaded in batches for data entry. Phew! On average, four months elapsed between the point of data capture and the first day of availability of that data to the sponsor. Monitoring participant compliance was also a challenge in this study, as it was impossible to discern when each patient actually completed their daily diary. The expenditures associated with this process for data entry tallied over $213 per patient diary, or $4.97 per diary page. The sponsor enlisted local specialty CRO, Signifikans, to help it identify and implement a better approach. Signifikans recognized that with OpenClinica Participate, the sponsor could have immediate access to patient data, and that this data would automatically sit right alongside data captured from other sources during the study. No EDC integration was necessary. Signifikans also took the lead on configuring the study in OpenClinica. (Our “make it simple” credo guides how we design tools for data managers, as well. That’s why we have invested so much in our forms engine, a topic for another post.) While building the study, Signifikans was able to easily demo prototypes to the sponsor along the way, iterating rapidly through edits and changes. Data capture forms were developed in the Swedish language, and the study was configured to send email reminders to patients to help ensure diaries were completed on time. The reminders contained a secure, uniquely-identified link the participant could click to go right to their diary, eliminating the need for participants to remember usernames and passwords. As soon as the study went live, the sponsor was able to monitor precisely when data were captured; something that was not possible with the old paper-based method. They observed, for example, that all five participants enrolled in the study’s first week each completed their diary card daily, per the protocol. The sponsor’s confidence in patient compliance and data quality surged; so much so, that they implemented an increase in the amount of data being collected this way. Scaling that quickly would have been impossible with paper diaries and slow transcription processes. The OpenClinica solution delivered a unified study database out-of-the-box, with patient-reported data sitting alongside clinician-reported data and accessible via the same interface. Having everything in one audit log made it easy to follow the patient’s trajectory through the study. Signifikans was able to use the same tools to configure and manage both ePRO and non-ePRO aspects of the study, resulting in a faster time-to-launch, and facilitating mid-study changes. In addition to enhanced data quality and faster access to data, the cost of data capture per diary with OpenClinica Participate resulted in cost savings of over 80%. 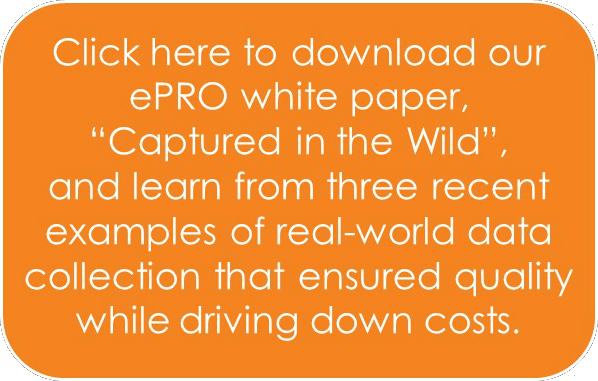 Keep an eye out for more ePRO success stories on this blog. Our next post will delve into a different topic, but, as with this one, you can be sure it will feature better results through a better eClinical experience.